Made of durable plastic with molded handles. Strong, snap on lids provide secure, stable stacking. 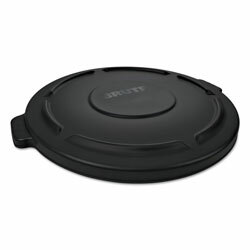 Lid Type: Flat Top; Material(s): Plastic; Color(s): Black; Shape: Round. Trash Can Lids from Rubbermaid! 2280 In Stock today.